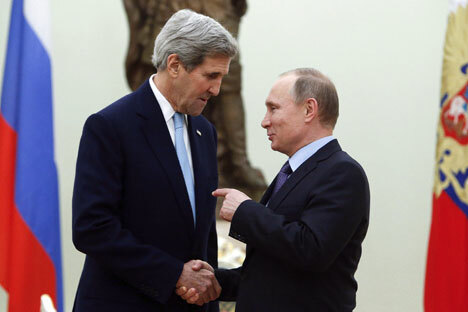 Russian President Vladimir Putin (R) speaks with U.S. Secretary of State John Kerry ahead of a meeting at the Kremlin in Moscow, Russia December 15, 2015. The dates for U.S. Secretary of State John Kerry's visit to Moscow next week have not yet been set and are still being worked out, Russian Foreign Ministry spokesperson Maria Zakharova said. "As it concerns U.S. Secretary of State John Kerry's visit, we are not talking about dates yet. They are being worked out," Zakharova said at a news briefing on March 17. Moscow expects Kerry to arrive next week, Zakharova said. "This visit will take place at the U.S.' initiative," she said. "Negotiations with Russian Foreign Minister Sergei Lavrov are planned. They will primarily discuss the Syria settlement issue," she said.